Welcome to edition 123 of Insider Weekends. Insider buying more than doubled with insiders purchasing $24.21 million of their stock last week compared to $12.04 million in the week prior. Selling declined sharply with insiders selling $474.05 million worth of stock last week compared to $983.98 million in the week prior. Sell/Buy Ratio: The insider Sell/Buy ratio is calculated by dividing the total insider sales in a given week by total insider purchases that week. The adjusted ratio for last week dropped to 19.58. In other words, insiders sold almost 20 times as much stock as they purchased. 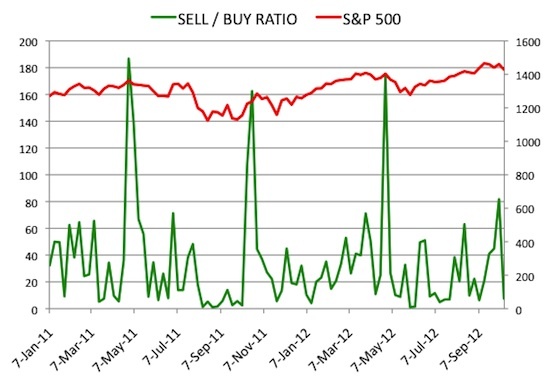 The Sell/Buy ratio this week compares favorably with the prior week, when the ratio stood at 81.72. We are calculating an adjusted ratio by removing transactions by funds and companies and trying as best as possible only to retain information about insiders and 10% owners who are not funds or companies. Director Hany Nada acquired 3,243,218 shares of this mobile gaming company, paying $3.05 per share for a total amount of $9.9 million. These shares were acquired indirectly through GGV Capital (formerly known as Granite Global Ventures). The stock reacted with a 16.61% gain on Friday.GGV Capital was one of the original venture capital investors in Glu Mobile. Over the last two years, I have seen both GGV Capital and another fund Becker Drapkin Partners sell shares of Glu Mobile in the $5 range and pick them back up when the stock pulled back to the $3 level. Becker Drapkin Partners is a Dallas based activist firm that tends to invest in small cap companies. To get a general overview of the app store ecosystem and Glu Mobile, you can check out our two part report about the company here and here. Voluntary Disclosure: I hold a long position in Glu Mobile. You can view the list of recent insider transactions for Glu Mobile, Inc. here. CEO & Chairman Phillip Frost M.D. acquired 453,400 shares, paying $4.36 per share for a total amount of $1.98 million. These shares were purchased indirectly by Frost Gamma Investments Trust. Vice Chairman & CTO Jane Ph Hsiao acquired 10,000 shares, paying $4.34 per share for a total amount of $43,357. Ms. Hsiao increased her stake by 0.06% to 17,900,231 shares with this purchase. It is interesting to see someone other than Dr. Frost purchasing shares of Opko. Ms. Hsiao has a long history of working with Dr. Frost including their time working together at Ivax (acquired by Teva Pharamaceuticals) since the mid-nineties. Despite these purchases we continue to avoid Opko as discussed in our weekly focus article about the company. Director Michael C. Armstrong acquired 5,550 shares of this market and economic information provider, paying $89.96 per share for a total amount of $499,264. Mr. Armstrong increased his stake by 15.27% to 41,888 shares with this purchase. You can view the list of recent insider transactions for IHS Inc. here. Chairman of the Board Harold C. Simmons acquired 36,000 shares of this chemicals and toxic waste management company, paying $12.12 per share for a total amount of $436,319. Mr. Simmons increased his stake by 2.28% to 1,613,853 shares with this purchase. Executive Chairman /Acting CEO Raphael Benaroya acquired 250,000 shares of this infant and kids products company, paying $1.55 per share for a total amount of $387,500. Mr. Benaroya increased his stake by 1068.15% to 273,405 shares with this purchase. You can view the list of recent insider transactions for Kid Brands, Inc. here. Director Michael A. Woodhouse sold 99,230 shares of this restaurant chain for $67.13, generating $6.7 million from the sale. Vice Chairman Lakshmi Narayanan sold 50,000 shares for $70.65, generating $3.5 million from the sale. These shares were sold as a result of exercising options immediately prior to the sale. President Gordon Coburn sold 30,000 shares for $72.00, generating $2.2 million from the sale. You can view the list of recent insider transactions for Cognizant Technology Solutions Corporation here. Chairman of the Board J. W. Marriott sold 92,000 shares for $38.46, generating $3.5 million from the sale. EVP & COO Robert McCarthy sold 41,113 shares for $38.80, generating $1.6 million from the sale. 30,150 of these shares were sold as a result of exercising options immediately prior to the sale. President/Managing Director Asia Pacific Simon Cooper sold 2,692 shares for $38.41, generating $103,400 from the sale. These shares were sold as a result of exercising options immediately prior to the sale. You can view the list of recent insider transactions for Marriott International, Inc. here. CEO Pizza Hut and YUM Innovation Scott Bergren sold 52,126 shares for $70.14, generating $3.66 million from the sale. Director Massimo Ferragamo sold 1,900 shares for $71.34, generating $135,546 from the sale. These shares were sold as a result of exercising options immediately prior to the sale. You can view the list of recent insider transactions for Yum! Brands, Inc. here. Executive Chairman John H. Pinkerton sold 50,000 shares of this independent natural gas company for $72.60, generating $3.6 million from the sale. You can view the list of recent insider transactions for Range Resources Corporation here.